WHAT DO BED BUG BITES LOOK LIKE? Signs and treatment of bed bugs. If you have woken up recently to find yourself covered in red bites on certain parts of your body, then there is a good chance that you have been a victim of bloodthirsty bed bugs. However, not everyone respond that strongly to bed bug bites, and often the bites of bedbugs can go unnoticed or is mistaken for mosquito bites or other insect bites. + BED BUG BITES TREATMENTs. To help you identify the bites of bedbugs, we have included a range of bed bug bite photos. Please note, however, that everyone tend to respond differently to bed bug bites, due to different allergic tolerances, and the images used here are images of the most common reaction to bed bug bites. One of the most characteristic signs of bedbug bites, are the appearance of bites in a row. This can be 2,3 or 4 bites in a row, and are often referred to as ‘breakfast, lunch and dinner’. This by no means happen all the time, however. The bed bug bites can just as well appear to be random, but if you see a distinctive 3 in a row pattern of bites on your skin, then you can be pretty sure that you have been bitten by these little critters. Also, a distinctive trait of bed bug bites is that they might appear on only one side or part of the body: The part that was easily accessible for a night snack, when you slept. NOTE, the different types of reaction from different people. Click twice on images to enlarge them. WHAT DO BED BUG BITES LOOK LIKE? This is a reaction with both swelling, welts and redness. This redness around the bite is indicative of a strong allergic reaction to bed bug bites. BEDBUG BITES: This is a particular severe reaction to bedbug bites. The bites often turn to blisters after they first appeared. The most common treatment for bed bug bites is Calamite lotion and Hydrocortisone creams, that can decrease swelling, redness and itching. But often, its just a waiting game and no treatment is strictly necessary. These creams are over the counter products and many others are available. If you get a severe allergic reaction to a bed bug bite, however, then please see a doctor. The most important thing to do at this point, is to look into how to get rid of them bed bugs themselves. Have a look around this website for more information on bed bug treatments. 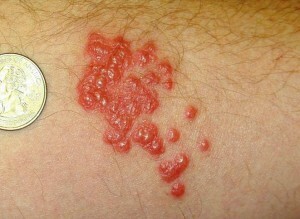 - For more bed bug bite images, see the BED BUG BITES PICTURES page. If you have an experience that you would like to share about bed bug bites, then please leave a comment here or on the home page. Thank you. I have experienced a raised red rash, sometimes appears like hives on both of my legs. I did not consider before that it might be bed bugs. I have looked at all the pictures on the web and read the info about bed bugs. I have not seen one sign of bed bugs on my mattresses, sofa or others furnitures in the house. Wouldn’t I see some signs of them if they were there. The main thing is treating and healing this horrible rash.